On September 18, 2018, I wrote a short piece on copper. At that time I was bullish but the red metal, contrary to my opinion, went slightly up and then entered a pretty long consolidation period. And up to now, nothing has changed. Further, consolidation periods are hard to analyze. However, there are some tools that may help to identify the state of the market during these problematic periods. It is a stressful situation for investors and speculators and many of them are wondering what next is on the cards. Let me try to give you a clue using the Commitments of Traders reports. To remind you, these reports disclose the positions held by a few groups of traders involved on the copper futures market. Today I would like to discuss the positions held by the so-called Money Managers (big speculators trading copper futures). Let me divide these traders into two groups: the bulls (Money Managers holding a gross long position in copper futures) and the bears (Money Managers holding a gross short position). Now, according to the COT reports, between September 18, 2018, and November 17, 2018 (the consolidation period) the bears cut their bearish bets by 15.6 thousand contracts while the bulls increased their position by 14.5 thousand contracts. What does it mean? 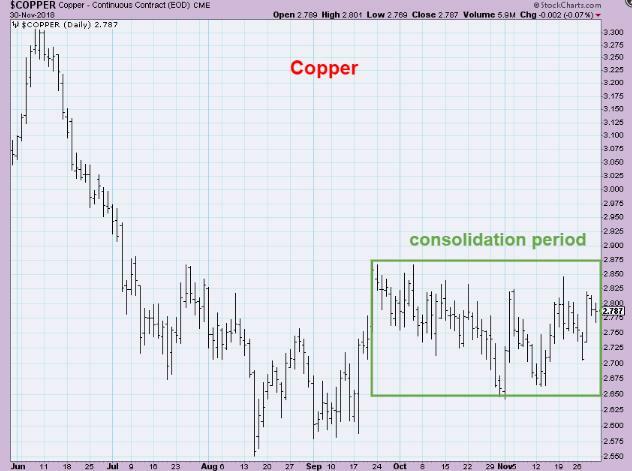 Well, it looks like the current consolidation period has been used by the bulls to increase their bullish position in copper futures. On the other hand, the bears have retreated losing the initiative on behalf of the bulls. So the final outcome is as follows: in my opinion, the copper is getting ripe for another leg up. This thesis is additionally supported by a few historical facts. For example, the previous consolidation period (April 2018 – May 2018) looked similarly – the copper prices were flat and the bulls were taking the initiative; then, in June, copper prices started a strong move up.